PowerPoint is a staple of the Microsoft Office suite. While PowerPoint is just one of many presentation software options, it has ascended to the ranks of Coke, Kleenex, Band-Aids, and Google as the de facto leader in its field. The word “PowerPoint” is used in a generic sense to refer to presentations and presentation software in general. Microsoft recently unveiled the new Microsoft Office suite--Office 2013--and with it PowerPoint 2013. Having played with the new PowerPoint for a couple weeks now, here are some of my first impressions. 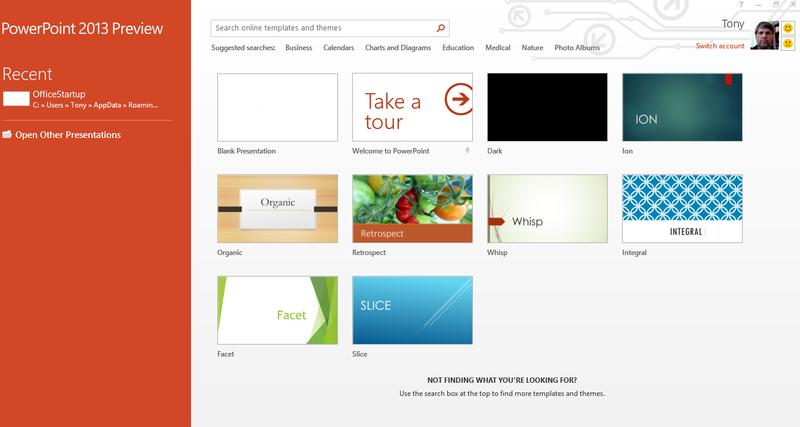 PowerPoint 2013 starts by presenting a variety of themes and templates to choose from. There are still plenty of people using Office 2007, Office 2003, or even Office XP or Office 97 because it takes care of their basic needs. The challenge for Microsoft when it develops a new version of its software is to add value without simply bloating the software with frivolous features to justify calling it a new version. It hasn’t always succeeded. With PowerPoint 2013, though, it seems that Microsoft does an admirable job of taking a step back to think about how people use PowerPoint, and what features and capabilities they need. It focuses more on improving and streamlining the existing PowerPoint experience, and less on adding new whiz-bang features. The result is a presentation tool that is easier to use than ever, and enables even novice users to create polished presentations. The new emphasis is evident right from the start. In PowerPoint 2010 there are themes and templates, but the software defaults to a generic white slide and it’s up to you to find the templates and themes and change the design after the fact. PowerPoint 2013 starts by presenting a variety of design templates to choose from. When you select one of the templates, it also presents you with a few different color themes to choose from to apply to the template. In a matter of seconds, you’re ready to start adding content to slides that look great. PowerPoint 2013 includes more of the features and capabilities of Excel and Visio to enable you to work with charts and diagrams, or create custom shapes directly from within PowerPoint 2013. PowerPoint 2013 also has broader support of audio and video formats for embedded media. My two favorite features of PowerPoint 2013 are the eyedropper, and the integration with the cloud. The eyedropper helps you easily tie the colors of your PowerPoint themes and slides in with the images you embed in the presentation. You can pick up colors from an image, and apply them to text or other elements for a smoother, more consistent look. Like Word 2013, PowerPoint 2013 defaults to saving files to your SkyDrive account in the cloud. That alone is nice--it helps ensure you have access to your files from anywhere, and from virtually any Web-connected device. The online integration that I appreciate even more, though, is the option to insert online pictures. You can pull images directly from Flickr or Facebook into your presentations. I have used PowerPoint 2013 primarily from a Samsung Series 7 Slate PC running the Consumer Preview release of Windows 8. As with the other Office 2013 products, Microsoft has worked hard to incorporate touchscreen actions and gestures that make it easier to work with the software from a tablet interface. In a nutshell, my first impression is that I find PowerPoint 2013 impressive--more so than I did PowerPoint 2010 as compared to PowerPoint 2007. Microsoft has done a nice job of modernizing PowerPoint for tablets and other next generation hardware platforms, and streamlining its functionality so it’s simpler and more intuitive than its predecessor.